This is one of my favorite Turkish dishes! Recipe below can be made vegetarian or carnivore friendly. Below is the lamb version. However, my husband says he actually prefers the vegetarian version, with the chipotle flavor. For vegetarian stew add a little chipotle chili for more body, otherwise the stew can be weak when paired with the eggplant purée. Sauté onions in olive oil or butter, then add the meat and brown. (For Vegetarian: add washed lentils and more water to accommodate lentils.) Add the peppers and sauté for several minutes. Add tomatoes and garlic and cook for about five more minutes, finally add the tomato paste and hot water. Let simmer for an hour to and hour and a half, until meat is tender. You may need to add more water. Roast the eggplant, you can poke holes in the eggplant and either roast in oven over broiler or on stovetop over open flame-until eggplants are soft. Peel and mash (or purée) with lemon juice. It does taste best if the eggplants are charred. Set aside. On low heat melt the butter, add flour, and stir to make a roux. Slowly add the milk and whisk to make sure the mix is smooth. Simmer for five minutes, then add the eggplant, stir well, then add the cheese. Stir well again, add salt an pepper and simmer for a couple more minutes. 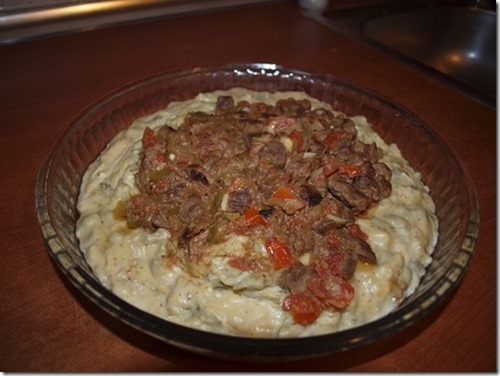 Make a base with the eggplant purée and spoon the stew on top. It can be served family style in a large dish (my preference) or onto each plate. Sprinkle chopped parsley on top. This dish is lovely as it can be made ahead of time and heated up and assembled later.